Sorry for the day delay. I had several ideas and blog posts started, but none that I finished. I was going to write about motivation…lost the mojo. I was going to write about binging…had to eat. I was going to write about mindfulness…couldn't maintain focus. Went to see Dr. Pita this week. I am gaining muscle. I have decided that since I am gaining more and more muscle which causes my weight loss to be a bit slower I am going to measure myself every month so I can see the results of my healthier lifestyle. Saw the clinic Social Worker, I am working on controlling my negative self-talk. Saw Miss Tappy Tap, I am working on mindful eating. Visited Dr. Pins and Needles, felt prickly afterwards. Worked out with PT Bruiser, my abdominals ache. I think that is all for this week. I have several e-mails from some of my readers. I promise to get to them no later than this weekend. The picture is from the Mini Marathon. 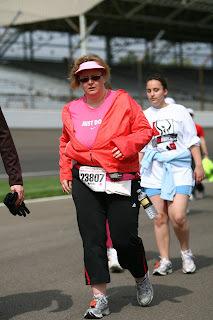 It is one of my favorites, not because it is a good picture, but because of all of the paraphenalia I have with me (water bottle, fanny pack, Garmin, napkin towel from the hotel). I also look like I am saying to the photographer; "Seriously? You are going to take my picture NOW?" It is also funny because Tara sped up to get out of the picture. I hope you had an enjoyable week! Thanks for all of the great messages I received regarding my last posting. I really enjoyed the encouragement and it reminded me that people DO read my blog! Last week I had an appointment with Dr. Pita. I informed him that I was having a lot of trouble concentrating. My mind has been racing a bit too much lately. Dr. Pita decided to teach me a new breathing technique that is supposed to help with maintaining focus. I started to get a little nervous when I realized it was demonstration time. I remembered how the last time I learned a breathing technique I learned I could not walk, breathe, and swing my arms all at the same time! Well, this technique is breathe in for a count of 4, hold for 7, breathe out for 8. We tried it together. He was taking so long counting I was slightly concerned he forgot what number was after 3. We did this a couple times and Dr. Pita got a bit frustrated with me and said; "You are not breathing from your diaphragm." He then comes rolling over, NEVER a good sign. (By the way, I LOVE those rolling stools. I zoom around the room when I am waiting for him. He then said; "Here, put your hand on my chest to see what you are supposed to do." Okay, he took a breath and the following thought popped in my head; "Seriously, do you have ANY fat on your body, Mr. ICanWearTheSamePantsIWoreinHighSchool?" I then focused and understood how I was to do the breathing. We did the exercise 4 times. My head hurt from the rush of oxygen that it apparently was lacking. Who knew!?!? Dr. Pita wrote down on a paper towel (of course) a reminder of how often to perform the exercise (no more than twice a day) and told me I could download it from the Internet, too. So, I downloaded the instructions from here and the exercise from here. Dr. Weil counts A LOT faster than Dr. Pita. It seems to work better for me at Dr. Weil's speed. Probably because I am not thinking; "Hey! If you kill me, you will lose a paying patient!" as I perform the exercise. I had a very good friend tell me last week that I am thinking about being healthy too much. She is concerned that it is turning into an "obsession" (at least that is how I interpreted what she is saying). Of course, in typical Kristi form I analyzed what she said over and over and over again. I cannot disagree with her that I think about how to be healthy ALL THE TIME. It probably is an obsession. As far as obsessions go, this is not necessarily a bad one as long as I do not take it overboard. I believe this obsession is rooted in my overwhelming fear of getting this far and reverting back to unhealthy habits. For everyone else to understand what she is referring to let me give you an example of a typical day. I get tweets constantly to my phone with affirmations and links to articles on healthy living topics. I get emails of articles on healthy living topics. Once a week I either see Dr. Pita or Dr. Pins and Needles. Once a week I see Miss Tappity Tap or the Weight Loss Clinic Social Worker. Once a week I see PT Bruiser.Right now, I am exercising 4-5 times a week insuring I get in at least 1550-1750 calories burned a week per my Polar Watch (last week it was closer to 2500). I track my food, mood, and exercise in Sparkpeople or on a chart in my purse in order to stay on track.I listen to healthy living podcasts. I Breath Walk every day (this can be accomplished by walking ANYWHERE). I do the homework assignments given to me by Miss Tappity Tap or the Weight Loss Clinic Social Worker. 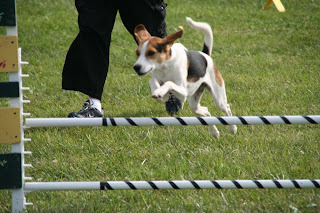 Go to agility and flyball two days a week. Practice and attend piano lessons. Work on getting rid of stuff I do not need in the house. Play with the dogs and cats. Practice my Spanish (I hope to go to Spain this fall). Work at our family store (I squeeze in real work and exercise when I am there). Work at my real job 40-50 hours a week. Read articles and practice stuff that I need to learn for my career. Go to "bad" dinners/lunches with friends. Insure that I sleep 8 hours a day. So...in my defense I hardly call it an obsession, but I do see my friend's point. I think that whether she intended it or not, the point that should be taken is can I keep this up? I have no choice whether I want to or not. Much like a recovering alcoholic, someone who is an overeater with the baggage that comes with it must remain vigilant. Doing this requires you to change as a person. I think in some cases your friends do not recognize you both physically and intellectually because the change is somewhat drastic. There is a reason that the divorce rate for those that have lost and kept weight off (especially bariatric surgery patients) is higher than the normal population (I read this somewhere). The question still stands: have I gone overboard? I do not know. Only time will tell. I can say this. I will fight, fight, fight to stay as healthy as I am today. I am actually working to be even healthier. I will remain vigilant so as to keep up the new life I am creating for myself. As you work to get healthier your friends and family may try to say that you are getting more selfish. Just remember that you need to take care of YOU first before you can take care of others. HOWEVER, this does not mean escaping from personal responsibilities. There is a fine line, but I truly do believe now that you can take care of your needs first and then the needs of others and both be better served. P.S. You will notice I went up a pound this week. It is water weight so I am not concerned about it. The biggest improvement I noticed this week is that I walked up 4 flights of stairs and was breathing normally!!!! Woo hoo!!! The photo is of my sister's dog Zorra. I just love that photo and since she has a "determined" look I think it is a nice pic for this post. June 3, 2009 - Cricket Anyone? I had another appointment with Dr. Pita today. One of the reason I went one week after last seeing him is because Dr. Pins and Needles is out of town. I am still trying to maintain some accountability by making sure I see at least one member of my "get healthy army" every Wednesday. Lately, my mind is consumed with thoughts like; "How do I insure I maintain my healthy lifestyle habits" and "I do not want to feel like I did before, is this bite of cookie the bite that takes me to the dark side?" Well, Dr. Pita had several suggestions when I start to get into a "funk" (I am not allowed to call it depression anymore, even though on the new charge form he circles that .) Primarily I need to change my physiology when I can. For example, if I am not smiling...smile. If I am looking down...look up. Okay, I will do that. Are you ready for this?!?!? "Unofficial Editor" of the cricket tournament blog for the Indy Friends Club. HAHAHAHAHAHA! I KNOW NOTHING ABOUT CRICKET!!! For those that do not know, for most of my career I have worked with primarily folks from the former British Empire (people from India and Great Britain primarily). Cricket is BIG there! Well, yesterday I got an e-mail that said; "Please rewrite for the blog." It contained short descriptions of the previous and future matches (is that what they are called?). Of course, I said; "OK!" So, for the next 6 weeks or so...I will be donating my time correcting and expanding on my friend's descriptions of the cricket tournaments. I also will be reading Cricket for Dummies. So...Dr. Pita...I AM doing something outside of myself and keeping my mind occupied. HA! P.S. I was down a pound of fat and up 1.5 pounds of muscle.